Yoshimitsu on Cosplaylab Contest! Please vote! This month the cosplay site Cosplaylab presents a look-alike contest featuring characters from Soul Calibur. I am participating with my Yoshimitsu costume (the only Yoshimitsu there). 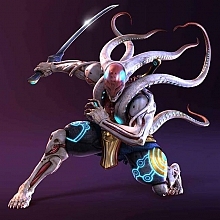 So please vote on Yoshimitsu! I would encorage we help out our fellow member, so do vote. it is upto you lot what you want to do. and good luck to you pykemitsu. Thanks for those who voted for me! How's your Tekken 5 Yoshimitsu costume? ^^ Finished?